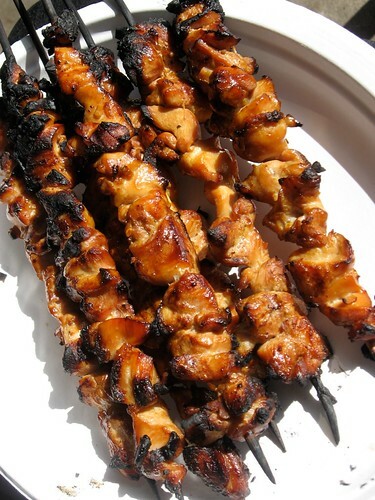 One of my most enduring food memories is grubbing on skewer after skewer of Filipino Barbecue, but it wasn’t until my friend asked me to cook for her son’s 2nd birthday yesterday that I even thought of making it myself. Filipino Barbecue is usually made with pork or chicken. and the marinade is a combination of salty, sweet and citrus components. Many recipes call for 7-Up or Sprite, which works as a sweetener and tenderizer. I found a recipe that I liked and made some adjustments and additions to come up with this marinade. I’ll probably tweak this a bit more when I make it again, but here’s what I used yesterday. This marinade works best with a 2-3 pounds of chicken or pork cut into cubes. If you use chicken, my preference is for thighs, but breast meat should work fine if you don’t like dark meat. It’s best to marinate the meat for only a couple hours instead of overnight, and then skewer the meat and grill it until it’s done. thanks for sharing this! recipe’s for delicious simple but mouth watering Filipino foods!